Today was Expo day for the SF Marathon. 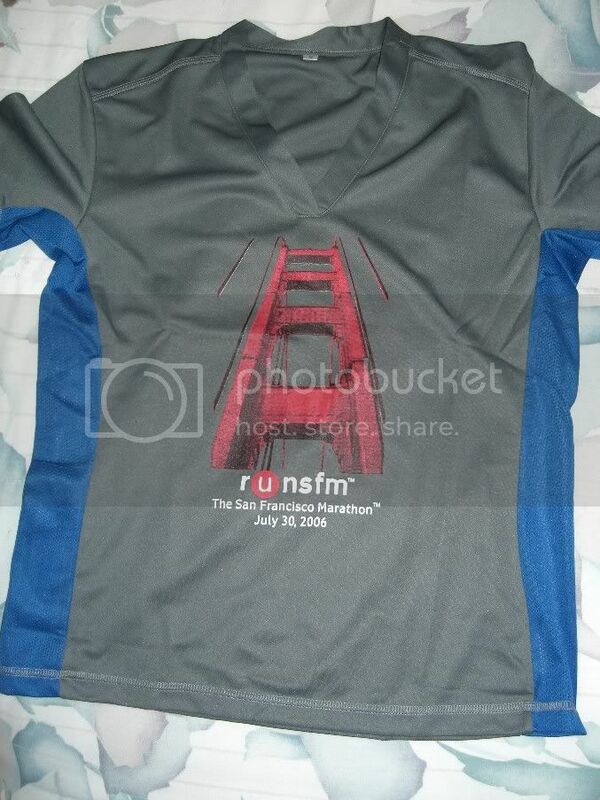 This included packet pickup and free stuff. Sadly, they set the ‘packet pickup’ to require you to traverse not 1 but 2 entire expo rooms full of vendors to get your stuff. First you had to crawl through an expo tent with vendors on either side of the very crowded isle to get your bib number. Then you had to go over and get your chip. Then you had to walk past all the vendors on the other side, out of the tent, across the street and through an entire other expo to get your t-shirt. It was a bit much. Furthermore they did NOT give away hats this year – just the t-shirt. I was a little bummed about the hat but I do like the shirt. Here is the front and here is the back. The blue strip is mesh and the rest of the fabric is nice, technical dri-wick stuff. I got lots a free stuff. Several packs of Jelly Belly Sports Beans, a couple of bags of chips (blue corn and black bean), some eco-friendly dishwashing and clothes washing detergent, some energy bars and some free food samples. I saw Bold’s buddies at Tanita who had the good graces to give me a great keychain presumably to soften the blow of telling me that I have 28.6% body fat. I could have gone the rest of my life without that bit of information. On the plus side, I am physiologically only 33 – woo hoo! (please don’t ask me if I actually believe that). After I got out of there I met up with Waddler26.2 who is running the half marathon but completely forgot to take a picture – argh! . She is very nice and I met her very nice daughter, too. 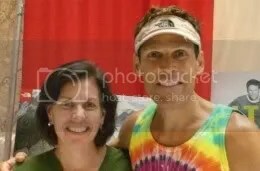 Then I went to find the host of the Marathon, my main man Dean Karnazes a.k.a. UltraMarathon Man. This is the guy I wrote about here who has run over 300 miles in one shot. This year’s trick will be to run 50 marathons in 50 cities in 50 days. My goal was to ask him to run me in on this marathon. Apparently that was a novel idea because he said, “sure – come find me and I’ll do that” I had to explain that I’ll be running and that he’ll have to come find me. He said he would so I told him I would be coming in between 10:30 and 11:00 and then held my bib up – #1030! Whoa – get it? 10:30 is the number, people. If I come in at 10:30 it will be quite the miracle because I’m not supposed to take off until 6. So it’s not bloody likely but it does give me something to focus on. The prospect of Dean showing up to run me in is also something to look forward to – we’ll see. I can’t imagine how he’ll remember any of that but a girl can dream. I bought another copy of his book which I had autographed and will raffle off for The Nike Women’s Half if I decide to run that with TNT. I’m still thinking about it. 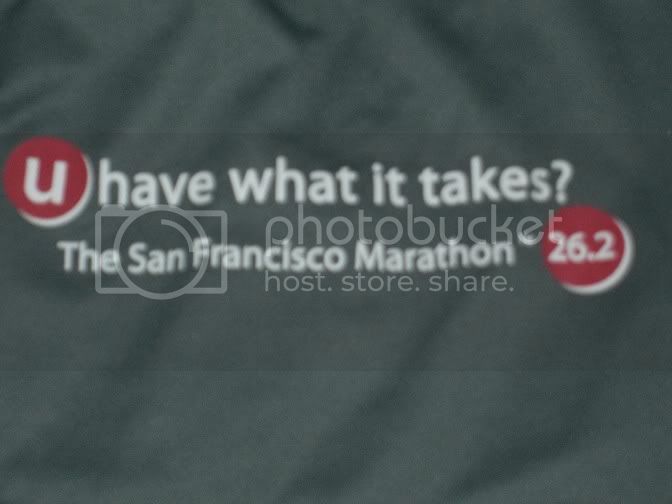 I also bought another SF Marathon Hat, signed by the man himself, from Organs R Us. So that’s it. I’m drinking enough water to drown an oil tanker, Waddler and our girls and I had pizza for lunch, I’m going to a dinner thingie and then going to bed early and tomorrow I’m off to the races! If you want to see how I’m doing you can go to this site and enter my bib number. Please don’t steal my thunder, though. I know it’s silly but I’d like to be the first to post my results – for better or for worse. Thanks for all the well wishes over lo these long hard weeks of training – it means everything to me! awesomeness! 10:30 and 1030…it’s just GOT to be a sign! Damn, how cool would that be to run with Dean? Very cool I’m thinkin. I think he has the hots for you. You be careful. :)Good luck! Run hard! I’ll be running you in — in spirit anyway. GO MOM! Get some rest and good luck tommorow. You will do great! Keep drink the sport drink and eat well tonight. Go girl go!! You sound incredibly calm. You probably won’t see this before your race, but I’ll be thinking of you. I like the shirt–I’m envious of that shirt! Again, good luck and dream of Dean Karnazes running you in. Looking forward to your race report. It was great to meet you and your daughter today==ther is no doubt you can achieve any goal you put your mind to. Good luck! I’m so excited for you! Good luck – looking forward to the cool-down report! Mom’s rock and so will you! !Your ready!Go! Good luck, in this moment my thoughts are with you. BTW I think that the real race was yesterday when you had to took your packet. We won’t steal your thunder. I just checked in on you and it looks like you are doing well. Good luck. I hope Dean finds you and runs you in. I like the photo.